The best way to know where Graciela will be speaking is to check this calendar. Keynote and educational presentations are highlighted below. Call (510) 542-9449 to inquire about booking Graciela for YOUR conference, school or corporate event. KEYNOTE: Texas Association for Bilingual Education conference, October 19, 2016, Galveston, Texas. FREE professional development workshops: "Personal Branding for Veterans" - May 7th, East Palo Alto Library. A short article about the event and a testimonial from the organizer is here on LinkedIn. California Association for Bilingual Education conference, March 24th: Two Author Panels, San Francisco: "The Need for Relevant Literature in Secondary Classrooms" (authors of nonfiction ) and "Insights from Award-Winning Children's Picture Book Authors." March 3rd, Pearland, TX - Private WINGS event featuring two women veterans, hosted by Imagiread to celebrate Women's History Month. February 17th - AAUW Pleasant Hill - Martinez Branch General Meeting, Keynote, St. Andrew's Church in Pleasant Hill. See page 5 in program here. February 19, 2016 - Program for Families and Children during Grand Opening Veterans Connect @ the East Palo Alto Library, 2415 University Ave, East Palo Alto, CA 94303; Graciela shared her military aviation service story and read Good Night Captain Mama. Flyer is below. November 17, 2015 - Keynote presentation, Orinda-Moraga-Lafayette Branch of American Association of University Women, Moraga, California. 9 a.m. coffee, 9:30 a.m. program. Holy Trinity Serbian Cultural Center, 1700 School St., Moraga. September 10, San Jose - KQED - sponsored Latino Heritage Month Panel at screening of documentary On Two Fronts: Latinos in Vietnam; School of Arts and Culture at the Mexican Heritage Plaza 6 - 8:30 p.m.
June 8 - Fairchild Air Force Base - Spokane, Washington;Michael Anderson Elementary School assemblies and gifting of 300 books, courtesy of Qualfon in Liberty Lake, WA. April 9th, Berkeley, CA - Latina Tech Entrepreneurs Policy Discussion, Details in image below. April 14th - Cal State University - East Bay - Cesar Chavez Leadership Presentation, Old Union building Room 311, 2-3:30 p.m. Enjoy Graciela's Hispanicize Event recap (song titled "A Few of My Hispanicize Things" (to the tune of "A Few of My Favorite Things" from "The Sound of Music," with photos) HERE. Download here as ppt with audio; download as simple pdf here. Auntie's Bookstore, Spokane, Washington, July 26th Come try on real military flight suits, scarves, gloves-explore military aviation charts and more after the reading of Good Night Captain Mama and Q & A about Graciela's military career. Flyer is here. ONLINE: Graciela Tiscareno-Sato appeared on LIVE Radio "Baby and Toddler Instructions" August 20th talking about the mommy entrepreneur life juggle. iTunes users can listen here. Everyone else can listen to the Podcast here. Americas Latino Eco Festival, Boulder and Denver, Colorado, September 11-15, 2014. Press release of event is here. Participation details (multiple forums and a keynote) will follow. Severance Middle School, Windsor, Colorado, September 17th - Advanced Writing Workshop with students who read Latinnovating as part of their G & T program AND "The STEM of Aviation" presentation for different group of students in the afternoon. "We loved the presentation! It was exciting to hear about Grace's life and how she overcame things that would hold her back. We liked that we got to try on her aviator's hat, too." 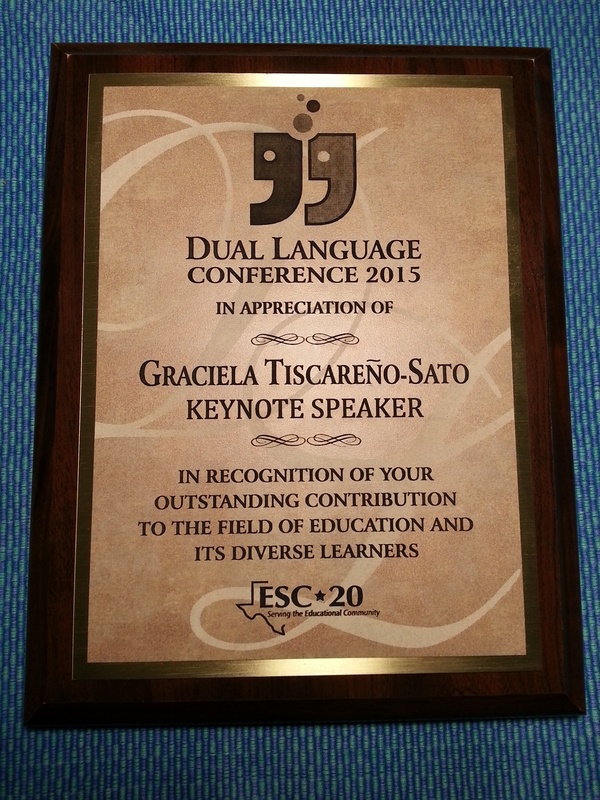 "I felt honored to be invited for this awesome presentation! I loved hearing about Grace's life story and how she reached her dreams even though, as a Hispanic girl, she would have been held back. I have the same heritage, and I've been told many of the same things that Grace was told as a girl. It's so exciting to have someone inspire me to know that I can follow my dreams, no matter what they are." "It was a privilege to watch Grace in action as she worked with middle school students at my school. The afternoon STEAM presentation touched many students. I heard comments about how inspired several students were after hearing Grace speak. I am grateful that my students had the opportunity to spend time with this amazing woman." Watsonville Public Library, September 27th. 1 p.m. English program; 2 p.m. in Spanish. More about the "California Reads War Comes Home" initiative is here. Santa Cruz Public Library, 2 p.m. September 28th. US Coast Guard Station, Point Reyes, CA, September 30th at 10:45 a.m. Hispanic Heritage Month event. Speech sponsored by Hispanic Chamber of Commerce of Marin. Latinas Think Big™ INNOVATION Summit, October 3rd at Google HQ in Silicon Valley. Leading roundtable discussion on entrepreneurship topics. Press release is here. Nov. 5-6th Veterans Day Celebration at Chemeketa Community College, Salem, OR. Multiple classroom presentations on various topics; Keynote speaker at campus wide celebration. Nov. 8th - California State University- East Bay, Hayward, CA; Fall Student Leadership Conference; led 45-minute "Personal Branding for Leadership" highly-interactive workshop for over 200 students. Slides are here. "Fantastic, bring her back!! Provided extremely useful information that allows for reflection and personal growth." "Highly recommend this workshop for students!" "Great workshop that should always be included in our leadership training." "Very helpful w/interviews and resume building!" "I love that I came to this. The idea of having others choose how they would describe me is something I will definitely use." "Excellent speaker, clear, thorough, informative." "This speaker was amazing! She was very knowledgeable and I will definitely take her upon her offer to connect." "She is such an awesome individual, OMG. Thank you for bringing her!" "Excellent!! Amazing and inspiring; please have her come back to CSUEB." "I really like her sincerity and connection with us." "One of the best speakers CSUEB has presented since 2001! Amazing and an honor to meet this amazing leader!" "Great accomplishments to back up her speech. Very well done." "I really enjoyed it, very helpful." "Graciela and Pilot Team, Mil gracias for everything you have done to ensure that our young girls from Los Robles and McNair were and are able to participate in this exciting field trip! Reading of Good Night Captain Mama in the Morrison Reading Room at Doe Library. Event flyer is here. Women of Aviation Week 2014; News Release with RSVP details is here. Event flyer is here. Event flyer in Spanish is here. "Graciela Tiscareno-Sato did an excellent job sharing with our students about individuals of Latino heritage that contributed a great deal of success to the United States. Her presentation was inspirational for our Latino Heritage Celebration Assembly. Our parents, teachers, those who attended the assembly and most importantly our students were inspired by Graciela’s story and the two individuals she presented us with: Jose Hernandez, migrant worker to astronaut and Air Force Lt. Col. Olga Custudio, the first Latina ever to graduate from Air Force military pilot training. Our students were motivated to dream big and not to put limitations on education, and the gifts and talents they possess. We are looking forward to having Graciela visit with us again soon." "As a member of the United State Air Force, Mrs. Sato was able to open the door to an American soldier's life . Students had an opportunity to see how soldiers serve our country in many different ways. Additionally, Mrs. Sato's book helped students see that soldiers are also mothers, fathers, sons, and daughters. It was an eye-opening experience for our students." Community Event for Hispanic Heritage Month, Panel discussion with 2 others at the San Mateo County Library, October 15. Flyer with program details is here. U.S.S. Hornet event, Keynote Speaker for "Living Ship Day; Fabulous Flying Females," September 21st, Alameda, CA onboard the aircraft carrier turned museum in Hangar Bay 3. Press release is here. Story in newspaper is here. Merced College, Literacy event for Hispanic Heritage Month. September 19th. April - Buck Lodge Middle School in Adelphi, MD, "The Unlikely Military Aviator"
Women of Aviation event, Keynote Speaker. Hiller Aviation Museum, San Carlos, CA. Details here. Good Night Captain Mama / Buenas Noches Capitán Mamá was been named an award-winner in the “Best Educational Children’s Book – Bilingual” category for the 2014 International Latino Books Awards hosted at the American Library Association national convention in Las Vegas. Author signing at the ILBA Booth at the ALA Expo and at the evening award ceremony. Event flyer is here. 2014 SHOUT! for Women Veterans art exhibit, June 12, 2014 at the Fort Mason Center in San Francisco. LISTAS (Latinas in STEM2 To Achieve Success) Inaugural Conference, Cañada College, Redwood City. "Management and Leadership: Latina Leadership - Creating your own path to success"
"Modern Women in the Military: History in the Making"